Posted on Wed, Mar 7, 2012 : 1:52 p.m. This is the second post in a series aimed at encouraging new gardeners. 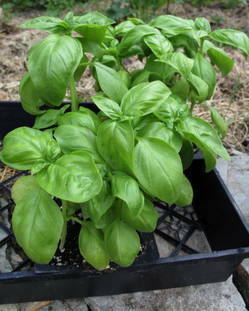 What are you going to grow in your vegetable garden? I have three suggestions to guide planning for your garden. The first step is simple: grow what you love. Make a list of what you think you'd like to grow and eat. Think of your favorites and write them down. You may not be able to grow all of your best-loved vegetables in your Michigan garden, but we have the ideal climate for many plants, so you'll likely be able to grow some of them. Don't make your plans around what is easy or plentiful. Having lots of turnips, for example, if you don't really like turnips, is poor choice, even though turnips are quick and easily grown vegetables. In our climate, a gardener can easily get in two and perhaps even three turnip crops in a season. Still, what's the point of growing a whole lot of something that you or your loved ones will not enjoy eating? Therefore, consult your heart and appetite. What vegetables do you appreciate the most? What will other family members enjoy? Make sure that you use your precious space to produce vegetables you and yours will be excited about harvesting and eating. You'll be more motivated to take care of vegetables you actually like. The second step is to investigate what grows well in your area. What grows well in Michigan? Many vegetables (and fruits) do. We've had success with many varieties of tomatoes, peppers, eggplants, broccoli, cabbage, kale, lettuces, carrots, potatoes, green beans, peas, summer and winter squash, pumpkins, cucumbers, radishes and beets. Fellow gardeners grow onions and sweet corn. If you know specific varieties of vegetables that you’ve enjoyed, look for those when you are purchasing seeds or seedlings. You can also spy on your neighbors — or maybe just talk to them, particularly the ones whose vegetables gardens you've admired over the fences. The chances are that if your neighbors have had good luck with growing certain plants, you will too. As you study up on plants you are considering, you'll have to make some judgments about the care or special requirements they have. We choose not to grow corn in our space because we don’t think the amount of yield we’d get from a small yard is worth our time or garden space. Other gardeners do think corn is worthwhile and so they are happy with their success. Some gardeners are willing to put in the extra efforts needed to grow blueberries in our area; the pH requirements of blueberries are very specific and are not the common soil quality in this part of Michigan. Some gardeners will work to adjust their soil, but for us, it makes the most sense to plant things that have the most chance of thriving. The third step is “think small” — for starts. The temptation to have a huge vegetable plot from the get-go is a strong one. If you are going to bother gardening, why not make it really count? Why not dig up half the yard and fill it will plants? Why not grow all of your own food? You shouldn't entertain that idea for long, however. In gardening, as in many things, there is no quicker path to failure than planting more than you have time or energy or interest to take care of. Instead, aim for a modest garden of manageable proportions. What is top on your list of things to grow? Pick maybe three or four items for your first garden. There is always next year for building on your success and expanding your garden. Remember to keep notes so you can look back on your first garden experience and see how much you've learned. These suggestions probably don’t answer all of your questions, but they should help you get started with planning. You might be wondering how many plants you should put in the ground or whether to go with seeds or seedlings. We’ll cover those questions in our next post.